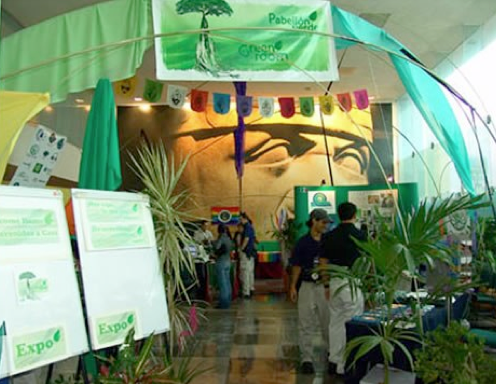 THE PORTAL: This threshold space features an informational map of the pavilion contents, tables with brochures and leaflets, and bulletin boards for displaying Green Dome Projects’ activities as well as a message board for participant networking. EXPO: This area of the pavilion is designed for sharing information and showcasing YOUTH best practices and innovative products. 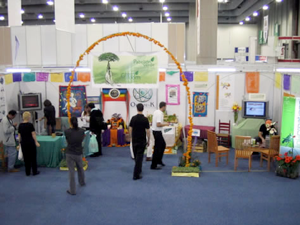 The Expo is also a place for exhibiting ongoing projects, sustainable products, videos, books, educational materials, posters, and related materials. WELCOME HOME: This niche is a casual, contemporary, and comfortable setting intended to promote interpersonal contacts, networking, interactions with mentors, reading, meetings, and information exchanges among youth. A WORLD OF INITIATIVES: Outfitted with its own database this space is in reality a powerful teaching tool. 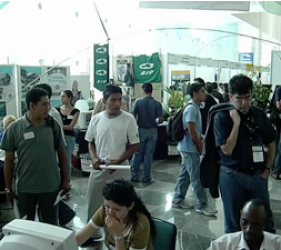 Equipped with high-tech digital links, directories, and websites, participants are encouraged to make individual contacts with global youth networks or surf the web for educational networks related to their interests. 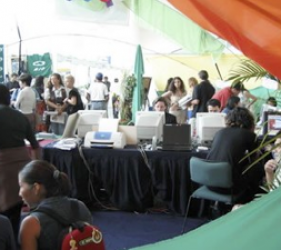 A keystone of Virtual Initiatives is a CD-ROM library with over 1000 books on alternative technology and sustainable projects sponsored by Earth Restoration Core. Participants can view Power-Point presentations on sustainable trades and skills required for restoration. This virtual voyage is geared to guiding youth into a realm of Earth-friendly opportunities and innovative entrepreneurial initiatives. VISUAL HARVEST: To further saturate participants with the concept that restoration projects are the key to future employment and the creation of well-being, Visual Harvest contains over 100 VHS tapes and DVDs on the subject. 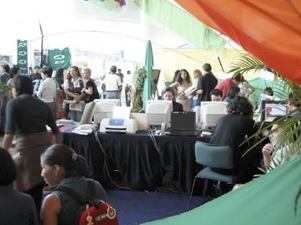 Equipped with earphones, monitors, assorted video-display equipment, computer-image projectors, and big screen with state of the art audio-visual programming, participants can listen to information in Spanish or English. Programs range from one-minute clips to hour-long documentaries on a panorama of topics, from micro to macro initiatives. CULTURAL PAVILION: Artistic expression and music are the lifeblood of contemporary youth. This space is equipped with sound equipment, including a DJs and CJs (disk and computer image jockeys). With a constant stream of visuals in the background, this room is available during the events for various cultural presentations and has the capability to expand for conferences. The creative heart of the exhibit, the Cultural Pavilion is an open, interactive, public space for youth, mentors, and visitors. 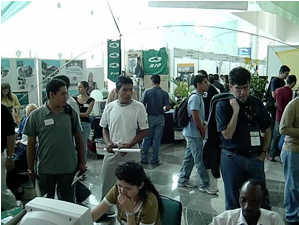 The first Green Dome EXPO was featured in 2004 at the EDC Sponsored Youth Employment Summit in Veracruz, Mexico with the collaboration and support of Hanne Strong, and the Manitou Foundation in Colorado. • A Dome infrastructure that houses a hospitality, edutainment, networking, cultural exchange and information center. • Internet video-conferencing providing chats with youth worldwide. • Youth-mentoring-youth, promoting their projects and giving talks on youth related subjects. • Shared exhibit spaces with a variety of presenters: CBYOs (Community Based Youth Organizations), NGOs and local programs that promote urban sustainability. • Youth Social Action — Distribution of DIY information and materials by youth and community building organizations. • International Youth Staff specializing in internet, communications, audiovisuals, radio, networking and reporting. • Art — Murals – Photography- Didactic exhibits and project displays. • DJ’s and CJ’s — Ambient World Music and spoken word. • A vast collection of grass roots and commercial documentaries in various languages. • Broadcast team for international updates of events, youth activities and live interviews. • Computers offering Alternative Technology Library and Do-it-Yourself web links. 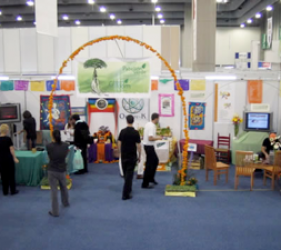 • A work area for small meetings, available to international and local participants. • A bulletin board to post announcements and messages.